In Kansas City, Missouri, 4Sight Construction (4Sight) is growing at an exceptional rate as a full-service general contractor in the multifamily and light commercial markets. 4Sight has made its name known by providing fully integrated general contracting, mechanical, and environmental services for their clients, including developers, property owners, investors and business managers. “We understand the critical components of a development project and work to address the needs of the developer and their team,” says Lynn Lang, president of 4Sight. Over the past 10 years, through a combination of subcontractors and in-house employees, 4Sight has built and/or renovated more than 8,600 multifamily housing units, representing approximately $170 million in construction activity. The firm’s geographic reach has extended to include numerous Midwestern states, including Kansas, Missouri, Nebraska, Iowa, Oklahoma, Louisiana, Indiana, New Mexico, and Ohio. 4Sight officially expanded from the parent firm, Yarco Company, in 2011, and continues to support clients in the realm of multifamily housing developments. “Our experience has led us to develop systems and procedures which coordinate and enhance the efforts of the developer, property management staff and construction personnel,” says Lang. In developing a streamlined approach to the construction and renovation process, 4Sight has expanded its operation to include mechanical and environmental services. “In providing a broad spectrum of in-house services, we maintain an integrated and seamless approach in responding to industry challenges,” says Lang. The company’s roots are embedded in the multifamily housing industry. With more than 25 years of experience operating in conjunction with a fully integrated real estate and property management firm, 4Sight recognizes the critical aspects of a development project and future management objectives as they relate to multifamily housing. At home in Kansas City, 4Sight recently completed the renovation of Friendship Village, a 145-unit, 130,040-square-foot project, located in the heart of the city’s urban core. Completed in 2014, the $14.2 million redevelopment plan was created from 4Sight’s relation and partnership with Yarco Development Company, U.S. Bank Community Development, Missouri Housing Development Commission and designed by architects Rosemann & Associates P.C. 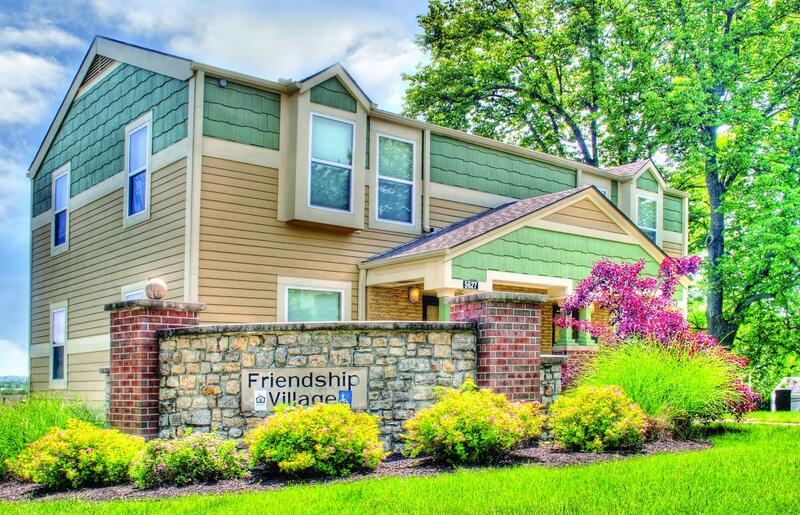 The collaboration of all parties resulted in a total transformation, turning Friendship Village into one of the most desirable low-to-moderate income communities in Kansas City. 4Sight’s scope of work involved the complete interior and exterior renovation of the apartment buildings, leasing office modifications, site improvements and the construction of additional site amenities. Interior apartment renovation included floor plan reconfiguration, replacement of the mechanical systems, door and window replacement, new interior finishes, and the replacement of cabinets, appliances and fixtures. Site improvements included the burial of overhead power lines, parking lot reconfiguration, street closure, and the construction of an outdoor learning park. Outside of the affordable housing multifamily market, 4Sight is also well versed in senior and assisted-living facilities. At the Elise Mason Manor in Des Moines, Iowa, the company completed a $7.2 million project to house the mobility-impaired and seniors age 62 and over. “This job consisted of the renovation of 150 occupied apartment units – all ADA compliant,” notes Helt. “The Elsie Mason Manor renovation was unique in many ways due to its location in the heart of the urban core, the renovation of an attached skywalk [an enclosed pedestrian walkway] and the addition of a 17-story elevator on the outside of the building,” continues Helt. The project was also designed using Iowa’s Green Streets requirements to promote public health, energy efficiency, water conservation, smart locations, operational savings and sustainable building practices. 4Sight recently completed a permanent housing development for homeless and disabled veterans at the award-winning St. Michael’s Veterans Center in Kansas City. Lead by Ian Leftwich, senior project manager, 4Sight partnered with Yarco Development and Catholic Charities of Kansas City to develop the $7.6 million, 58-unit apartment complex offering permanent housing options for at-risk veterans. At more than 55,000 square feet, the complex is complete with a vast amount of amenities including a computer lab, a library, an exercise room, laundry facilities on each floor, community and meeting space, and support service offices. Leftwich says the St. Michael’s Veterans Center has been by far one of the most rewarding projects for 4Sight. “This project has the ability to truly transform the lives of the occupants,” he says. Through a progressive approach, St. Michael’s helps occupants adjust to independent living by offering a magnitude of services such as transportation, care and professional management programs, peer-to-peer counseling, custom-designed legal aid, healthy living classes, resume writing, interview preparation and job placement services. The center also offers GED education referrals, job skill training, employment services, financial education and coaching, and income support access. For its impact on the community the project has garnered several awards, including The Kansas City Business Journal Capstone Award and the Kansas City Economic Development Corporation Cornerstone Award for Community Development. St. Michael’s Phase II includes the construction of 59 additional housing units and 7,600 square feet of office and community space. Phase II is scheduled to break ground in summer 2015. With the successful completion of numerous projects, the firm continues to streamline the development process through partnerships, focused care and attention. 4Sight Construction continues to work toward its mission of providing highly marketable, quality products while keeping the cost down for clients and delivering excellent value.